Sparkling at any angle and in any light, this brilliant necklace by Hearts on Fire is cut and polished by specially trained artisans. Only 400 people in the world are trained in the “perfect cut” that gives these diamonds their signature brilliance. 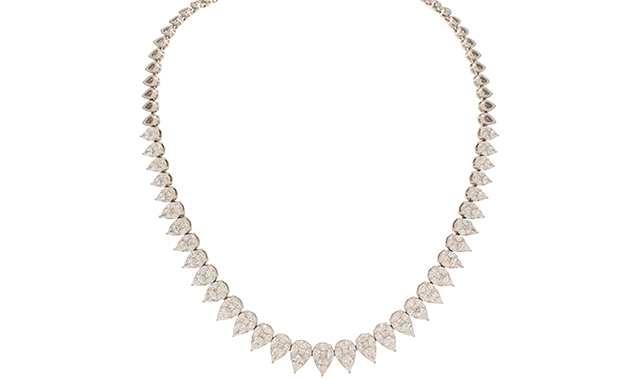 From the Beloved collection, this necklace includes 2.64 ct. of diamonds set in 18 karat gold. Available at State Street Jewelers, 230 W. State St., Geneva. Both chrysoberyl stones are very, very pure – an incredibly rare pairing of a gem whose signature “catseye” effect is a reflection of light. This pair of earrings, designed by Oscar Heyman & Brothers, is set in platinum with 20 oval diamonds, totaling 5.42 ct.t.w. Available at M.J. Miller & Co., 123 W. Main St., Barrington. Each bracelet and necklace in this collection by Anne Sportun is comprised of several strands of gemstone beads, crafted from materials such as ruby, garnet, green onyx and zircon. Available at Studio 2015, 11701 Catalpa Lane, Woodstock. 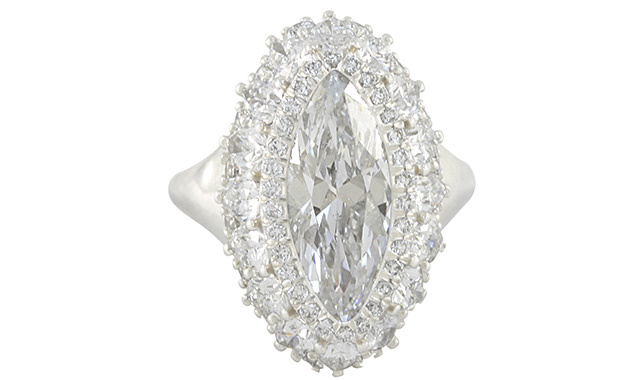 This custom-made marquise diamond engagement ring echoes the early 20th century Art Deco style. A platinum setting holds the inspirational 2.81 karat marquise diamond, which is surrounded by a row of round brilliant-cut diamonds and another row of 16 pear-shaped diamonds. Designed by and available at Burdeen’s Jewelry, 1151 W. Lake Cook Road, Buffalo Grove. 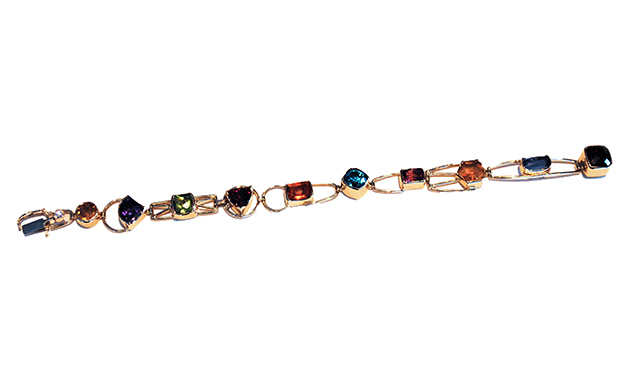 Set in 14 karat yellow gold, this custom-designed bracelet contains seven semi-precious stones: citrine, amethyst, peridot, garnet, tourmaline, tanzanite and blue zircon. The stones were selected during one of State Street Jeweler’s biannual Gemstone Roundtable events, where customers can meet a stone cutter and select gems collected from mines around the world. Designed by and handmade at State Street Jewelers, 230 W. State St., Geneva. The brilliant electric blue-green stone at the center of this handmade necklace is one of the rarest stones on earth. 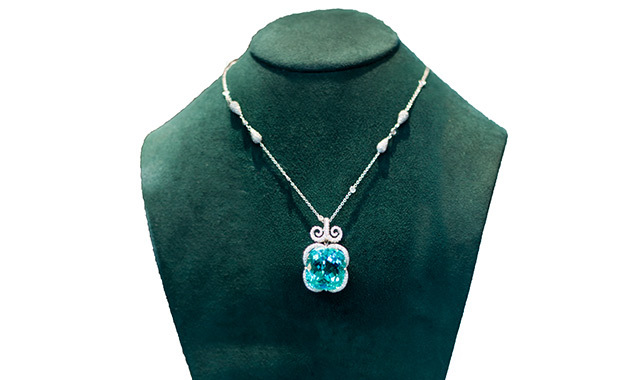 Discovered in Namibia, this paraiba tourmaline stone is surrounded by 706 diamonds, totaling 40.16 ct.t.w. The setting and chain are formed from handmade platinum. Designed by and available at M.J. Miller & Co., 123 W. Main St., Barrington. 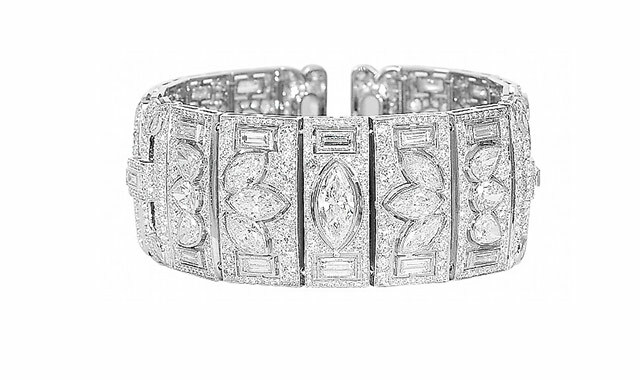 An original design by Matt Burdeen, this Art Deco armlet recreates the opulence of the 1920s. Set in 18 karat white gold, these large center diamonds are surrounded by smaller diamonds, together totaling 32.94 ct. Designed by and available at Burdeen’s Jewelry, 1151 W. Lake Cook Road, Buffalo Grove. 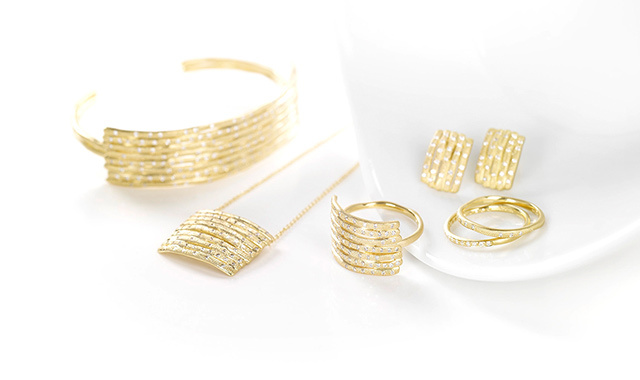 Designed by Anne Sportun in Toronto, these clever pieces are built from stacked layers of 14 karat gold. 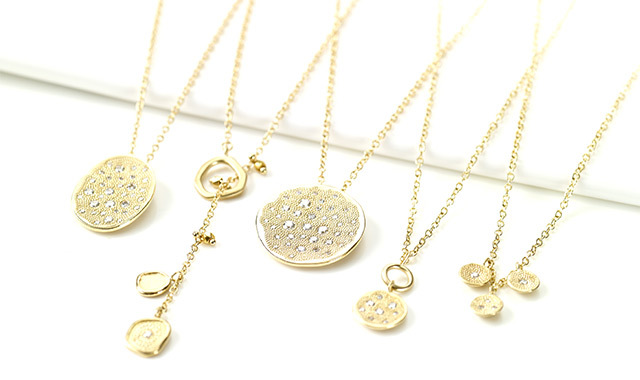 Each piece is inset with round brilliant-cut diamonds. Available at Studio 2015, 11701 Catalpa Lane, Woodstock. 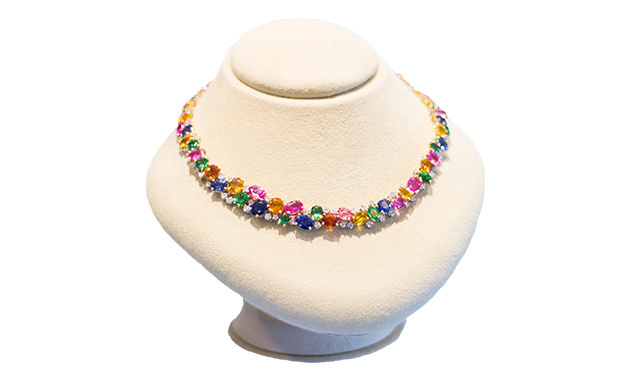 It took the designer two years to assemble all of the matching stones in this brilliant, multicolored necklace. The naturally colored yellow, green, pink and blue sapphires are matched with green tsavorite garnet, together toltaling 17.89 ct.t.w., and are interspersed with 112 diamonds totaling 9.25 ct.t.w. 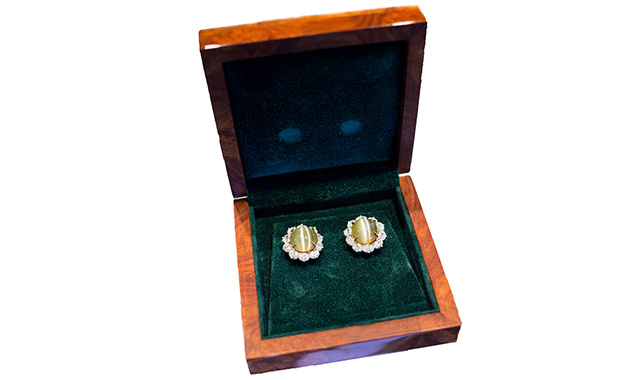 The setting is 18 karat gold. Designed by and available at M.J. Miller & Co., 123 W. Main St., Barrington. The reddish hues in this sparkling ring come from the alloys used to create the 18 karat rose gold mounting, custom-designed by Elma Gil. This ring contains 1.5 ct.t.w. in round diamonds. Available at State Street Jewelers, 230 W. State St., Geneva. 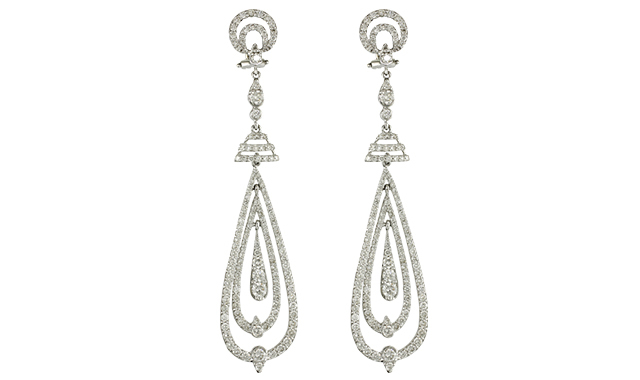 Set in 18 karat white gold, these concentric diamond teardrop earrings are covered in diamonds, including the decorative pear-shaped stones that hang inside the teardrops. Diamonds total 4.14 ct. Available at Burdeen’s Jewelry, 1151 W. Lake Cook Road, Buffalo Grove. 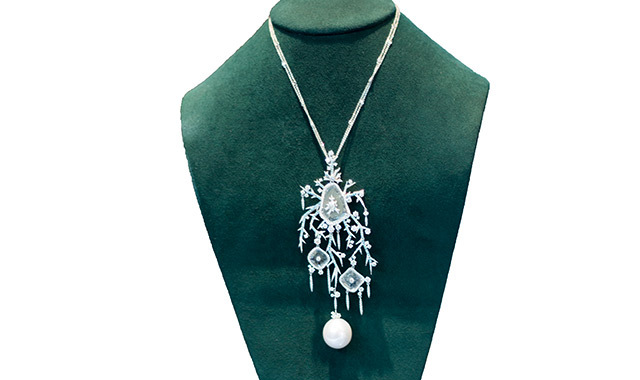 Worn as a pin or pendant, this sparkling necklace was made for the 2013 Winter Pearl Expo in Denmark and was worn by Queen Margrethe II. The snowflake includes slices of white diamond, accents of white faceted diamonds and Paraiba tourmaline, totaling 14.76 ct.t.w in an 18 karat gold setting. Available at M.J. Miller & Co., 123 W. Main St., Barrington. Modeled after several styles by Anne Sportun, these whimsical gold charms are set with semi-precious gemstones on a gold chain. Available at Studio 2015, 11701 Catalpa Lane, Woodstock. 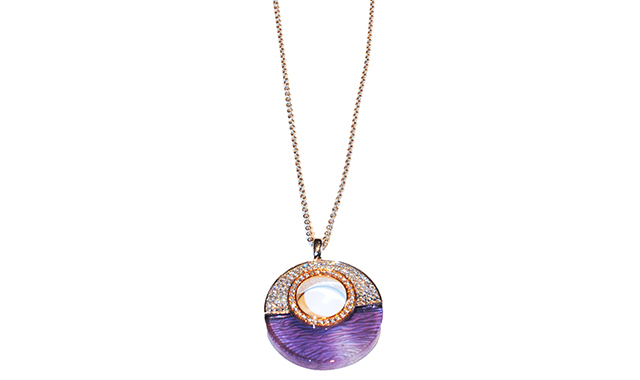 The violet amethyst stone in this pendant has been custom-cut, its back textured with small ripples that add depth and dimension. The top section, made of 18 karat white and yellow gold, is pave set with 75 ct.t.w. of round diamonds. Designed by Frederic Sage and available at State Street Jewelers, 230 W. State St., Geneva. 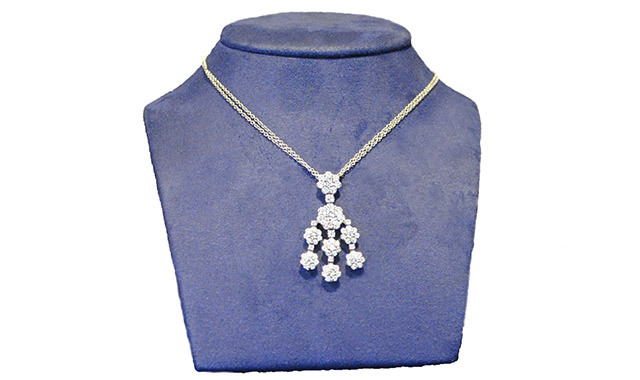 Stunning and timeless, this elegant 18 karat white gold opera necklace holds 15.61 ct. of pear-shaped diamonds, with graduating diamonds completing two-thirds of the necklace. Available at Burdeen’s Jewelry, 1151 W. Lake Cook Road, Buffalo Grove. 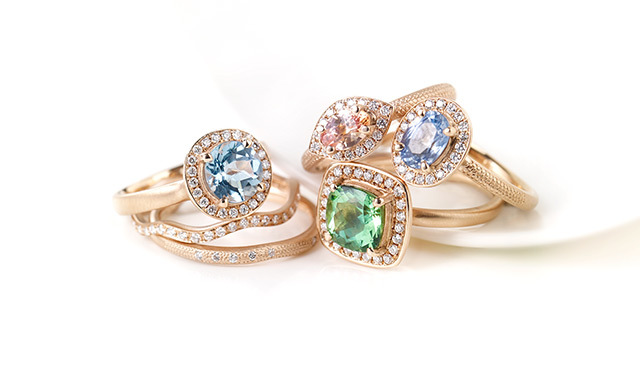 Available in many styles, these colorful rings, set in rose gold, can be matched with several kinds of precious and semi-precious jewels. 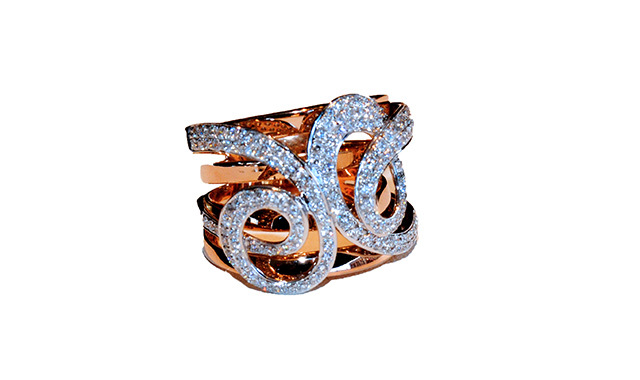 Round diamonds are embedded within the textured sides. Available at Studio 2015, 11701 Catalpa Lane, Woodstock. This entry was posted on Wednesday, January 28th, 2015 at 12:00 pm	and is filed under Northwest Woman, Top Posts. You can follow any responses to this entry through the RSS 2.0 feed. Both comments and pings are currently closed.